The goal of many kayak owners is to store their kayaks outside, at or near the water, so they don't have to lug them around when they want to use them. It makes it much easier and faster to get out on the water, and saves a lot of energy for paddling. Kayak dock racks are the holy grail of kayak storage because it creates easy access to the water for you and your kayak. Construction for outdoor use: For kayak racks to withstand outdoor conditions over time (and resulting rust and corrosion), they need to be made of the proper materials and finish. Stainless steel and aluminum are generally good choices for the construction of a kayak dock rack. And a powder-coat, marine grade, or galvanized finish are important for the wear of your dock rack. Look for kayak dock racks with some combination of these materials and finishes to optimize your outdoor kayak rack's life. Where is the kayak stored? Some kayak dock racks store your kayaks on the dock, while others store your kayak over the water. Depending on what size dock you have, one may be a better option for you than the other. It's great to free up your dock space with an over-the-water storage rack. How many kayaks to store? If you need to store multiple kayaks, you'll need a larger rack. This could impact your storage options - for example, you'll likely need an on-the-dock rack if you're storing 3 or more kayaks. Load assistance for kayaks: Some dock racks have a functional load assist option that serves as a system to get your kayak in the water for you, and then when you're finished, to raise the kayak out of the water and back into storage on the dock. 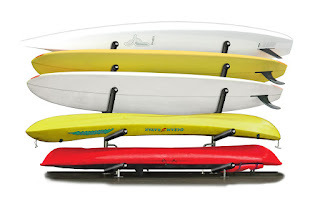 Over the Water Kayak Dock Rack: this kayak rack optimizes space on your dock by storing your kayaks over the water. It comes in a galvanized finish that is great for the outdoors, and in versions for 1 Kayak, 2 Kayaks Horizontally, or 2 Kayaks Vertically. 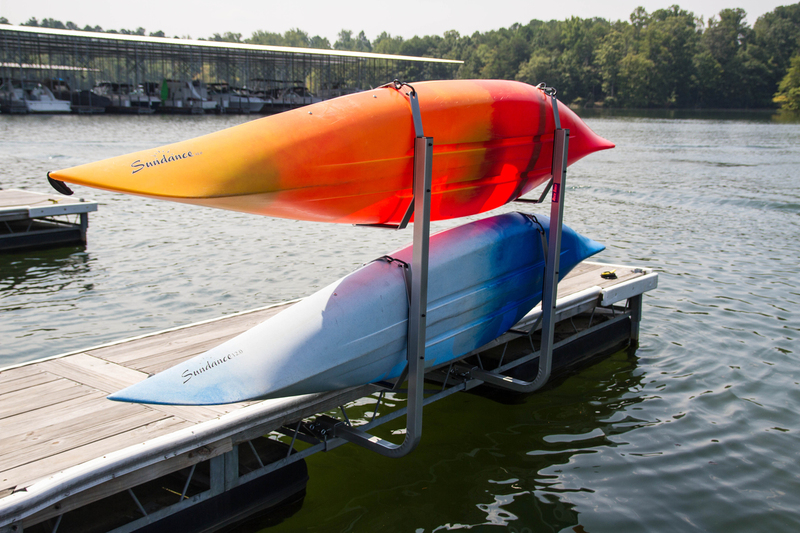 It's up to you how you want to customize your kayak dock storage. Stainless Steel Kayak Dock Rack - Multiple Kayaks: this kayak dock rack is a top-of-the-line storage rack, great if you have multiple kayaks. It mounts to the deck of your dock and can be customized with up to 4 sets of flat storage arms for 4 kayaks. One con to consider is that if you have a smaller dock, the rack will take up space on your dock. Load Assist Kayak Dock Rack: this kayak dock rack is a pretty ingenious way to help you load your kayak into the water and take it out when you're finished. The rack has a large handle that you can pull down to pull your kayak into the water. 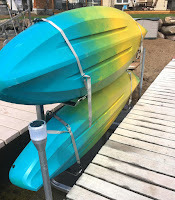 When finished, hop out of the kayak, load it into the straps, and pull the handle back up, which will pull your kayak out of the water into the dock rack for storage. It's got 2 different mounting options to fit your dock - bolt on or clamp on.